Experience the best Canada Geese, Specks and Snow Geese hunting in Kansas! We would like to invite you or your group to come join us in Kansas on a goose hunting adventure like no other! We have access to thousands of acres in this area, and our private lands which are scouted daily in order to maximize your hunting experience! Kick off your boots and relax after a long day of hunting in Kansas! We provide lodging, with two 2,700 square foot lodges with 3 bathrooms, 180" digital satellite television, antique Brunswick billiard table, lots of beds, 2 heated garages to dry your boots, and a heated shop to clean the game. When duck hunting with NCK Outfitters we strive to ensure our hunters receive the best duck hunting experience that North Central Guide Service has to offer. 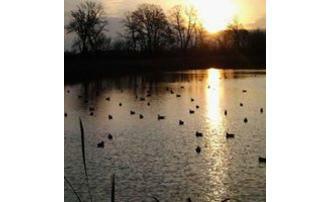 NCK Outfitters are where the ducks are! We offer top notch lodging, accommodations, guides and locations.